Three University of Iowa graduates drafted the UI Alumni Association's first constitution 150 years ago. Throughout 2017, the UIAA marks this special anniversary of service to graduates and their alma mater. Only 20 years after the official founding of the University of Iowa, Rush Emery, 1863BA, 1864MA, was elected alumni president in the earliest recorded gathering of Iowa graduates. At that June 1867 banquet, the alumni present decided that graduates would be eligible for association membership "during their good behavior." Many banquets followed, each more elaborate than the last. Iowa graduates have gathered together under the alumni association banner ever since—united by a shared affection for the University of Iowa. That mission has never changed. Throughout the decades, the UIAA has supported all manner of campus priorities, including a research lab on the shores of Lake Okoboji, the Iowa Memorial Union, a groundbreaking campaign to build the original arts museum, an endowed faculty chair in the College of Liberal Arts and Sciences, and various student scholarships. In fact, it was the alumni association that initiated the first-ever campus fundraising campaign in the 1950s, leading to the establishment of the Old Gold Development Fund, the concept of annual giving, and eventually the UI Foundation. The UIAA would later move away from informal social gatherings to a more serious mission. As writer Ellen Rich offers from the 1898 Hawkeye: "The main objective of the association has not been feasting and merry-making. It has always been burdened with anxiety concerning the future of the university. The question has never been a choice of personal pleasures but a means of inducing the state to provide for the needs of the institution which we all love." Alumni offices at the IMU and in Old Capitol (below), 1927 and 1931. That focus would come with a second, more formal reorganization of the UIAA. The early association functioned on funds from the university; it weathered the ups and downs of history and the First World War, soon becoming crippled by the Great Depression like so many other organizations. A post-World War II revival in 1947 brought about the restructuring of the UIAA as a financially independent entity, powered by alumni support, with UI President Virgil Hancher, 18BA, 24JD, 64LLD, appointing Loren Hickerson, 40BA, the first full-time director. Hickerson himself would later note, "By his nature, Hancher sensed that the university's effectiveness as a public institution literally demanded the friendship of alumni." At the time, the association had 980 members with annual dues of $1. Hickerson initiated the bimonthly Iowa Alumni Review and set more realistic dues at $4. "From the very beginning, the alumni association has focused on the creation of communities—to provide the means and opportunities for Hawkeyes to gather, socialize, and celebrate their accomplishments and those of their fellow graduates, UI students, and faculty," says UIAA President Jeff Kueter, 93BA. "As we celebrate 150 years of service, we also will use 2017 to highlight how Iowa's friends and alumni continue to help each other and their alma mater. Through a national program of service, expanded networking and career services, and enhanced regional programming, the association provides a means for alumni to form enduring relationships that positively impact themselves while serving as advocates, volunteers, ambassadors, and supporters for the UI." During our last big celebration, the 125th anniversary in 1991, the UIAA received recognition as the best overall alumni program in the United States and Canada from the Council for the Advancement and Support of Education (CASE). Surpassing the likes of the University of Michigan and the University of Notre Dame, the UIAA came out on top for services that best support the overall needs of alumni and their university. Although some activities have changed—as well as our location on campus—the tradition of excellence continues. Alumni still receive valuable university news through our award-winning magazine. We've sponsored countless reunions, parent weekends, IOWA Club events, and notable programs for students, young alumni, seniors, and everyone in between in hopes that all Hawkeyes feel part of the Iowa family. To kick off this milestone year, Iowa Alumni Magazine presents a historical overview of the UIAA's contributions to campus and alumni. Just as you are always a Hawkeye, we will always place the welfare of this great institution at the forefront of what we do. 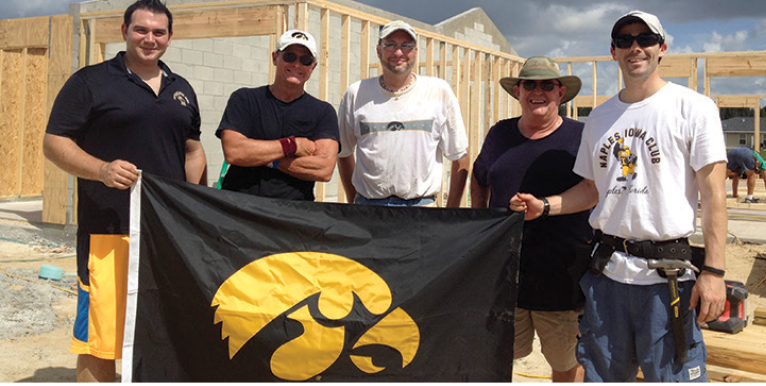 IOWA Club members participate in nationwide service projects. Loren L. Hickerson was born near Mount Ayr on Aug. 7, 1918. He graduated from Mount Ayr High School in 1936 and from the University of Iowa in 1940 with a bachelor's degree in journalism. On Aug. 23, 1941, he married Ellen Christensen, 39BA, 58MA, and they had two children, Karl and Sally. He was assistant director of publications and editor of the Daily Iowan until 1942. During World War II, he served for two years on the aircraft carrier USS Langley in the Pacific theater. After the war, he returned to the University of Iowa as an instructor in the School of Journalism. 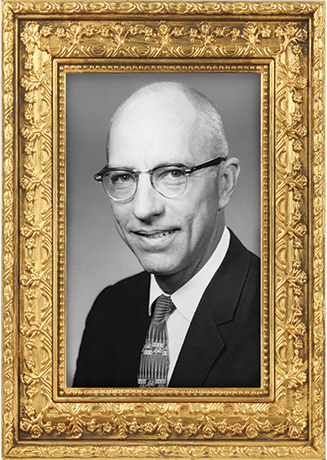 From 1947 to 1966, he was UI director of alumni records and executive director of the alumni association. From 1966 to 1972, he served as UI director of community relations, and from 1972 to 1980, he was director of community and media relations for the UI Center for the Arts. Hickerson also served on the Iowa City City Council from 1966 to 1974, including two terms as mayor. A man of immeasurable eloquence and a gifted writer, he was a highly sought-after speaker who nurtured pride in his state, university, and community. He died in 1989. Says Vince Nelson, UIAA executive director from 1997 until 2014: "Loren Hickerson was beloved for all that he did for this institution. He brought to his position a love for the university, the state of Iowa, and our alumni." The UIAA's Loren Hickerson Award recognizes individuals for distinguished service to the alumni association. The first-ever iteration of this magazine, the Iowa Alumnus, published on Dec. 15, 1903, and was delivered to the homes of 100 UI alumni. The lead article informed readers of the death of anthropologist Frank Russell, 1892BS, 1895MS. The issue printed before the publishers had secured funding or subscribers, but they forged ahead on the positive results of a questionnaire that asked alumni: "Would you subscribe for a quarterly alumni publication?" Alumni were promised a magazine that would bring them closer to the modern university, a publication "that will not be a mere newsgatherer, a gossip-monger, or a hobby-horse...it will, however, aim to be of interest to alumni and other friends of the university, and to the university itself...the subscription price of the Alumnus is $1 per year, payable in advance. Prompt payment of the price will ensure its regular visits—nothing else will." The next issue included alumni responses to the premiere publication, with writers from various states sending their well wishes and enclosing money with the note, "please enter my subscription for as many years as the above amount will pay." The Alumnus reported it all and established a dialogue between alumni and the University of Iowa. Though the tone was usually positive, editors did not hesitate to criticize the university community when warranted. In April 1904, they suggested the widespread lack of manners among college students should be studied by someone in the psychiatry department. Another article protested the General Assembly's proposed "handsaw surgery," whereby Iowa's engineering department would be transferred to the State College at Ames. Pointing out that the alumni themselves had forestalled the legislature, the magazine suggested the Board of Regents "might have presented their case to the General Assembly better" and prodded the governing board to do more. As with any publication, the Alumnus had its critics. From the letters section of the June 1904 issue: "If the worthless old thing is sent to me next year, I shall send it back to you at your own expense. It is not worth reading and it does not go far as kindling. Erase my name, or make your magazine worth its space on my shelves." In the early 1920s, when there were about 30,000 alumni, about 2,500 received the magazine. Until lack of funding stopped publication in 1924, the Iowa Alumnus was quite the force of journalism. Unfortunately, the UIAA would be without a magazine for the next 22 years. When the alumni association reorganized in 1947 and Loren Hickerson was appointed alumni secretary, a new magazine was founded to form the cornerstone of the organization. 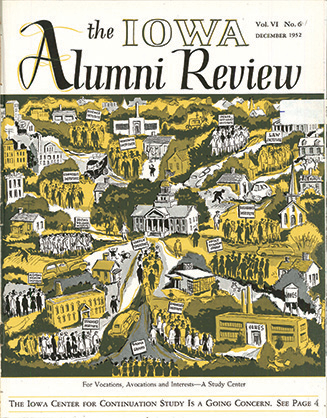 "Membership in the association henceforth will be based on a subscription to the Alumni Review," Hickerson informed readers in that first issue. For $4 per year, members could again read news of their classmates and the campus they'd left behind. The new magazine reported the raising of many buildings (not unlike last November's Iowa Alumni Magazine). Iowa's first centralized library, Carver-Hawkeye Arena, and the laser facility were among the new ones. Others were razed: Old North Hall, the Armory, and the "Barracks." Through the pages of Iowa Alumni Review, readers were instructed on how to watch a football game and bake a blue cheesecake, discovered how a horse posse popularized opera, and followed the Scottish Highlanders on their travels. The magazine has been around so long and remains the link that ties thousands of alumni to each other—and to the University of Iowa. Adapted and excerpted from "Looking Back at the Alumni Magazine" by Carol Harker, September 1991, Iowa Alumni Review. "The association does great service to the alumni...in keeping fresh the memories of student life and in bringing those of earlier years into touch with the university of today." From the 1896 Hawkeye yearbook, on the annual meetings that became known as Alumni Day. After World War I, President Walter Jessup combined the need for a union with the desire for a memorial to students who had been killed in action. He proposed a memorial union, which would be the "hearthstone" of the whole university. The alumni association immediately picked up the idea and created the Iowa Memorial Union Corporation, headed by a board of trustees instructed to raise a million dollars for the construction of a suitable building. "As Old Capitol is the center of our official life, this will be the focus of our social life," Jessup explained during the student union campaign.